Caution: Mermaid Crossing: Am I Crazy? It's entirely possible that I'm a little crazy; perhaps even driven to that place. This should not be confused with being referred to as, eccentric. I'm a complicated and annoying mix of dreamy optimism with unrealistic desires; and a dog with a bone for things I believe in or have to fight for. I wish it wasn't so. It would be far easier to be light and breezy. I care to the point of stress and worry. I can't turn away from harm to what's precious, not even when it might protect me from anxiety. My father, who had little patience in the role of parent, taught and expected me to be independent, strong, and fierce. He wanted me to begin this path by the time I was the age of three when my mother passed. He encouraged me to be a fighter and stand up for what's right. I don't know how to be any other way. The 1st photo of the 101 freeway shows a small glimpse into the mass destruction caused by a flood and mudslide on January 9th in Montecito soon after an intense, drought-driven fire. 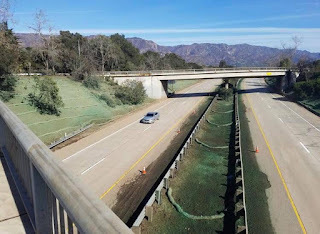 The devoted first-responders, search & rescue team, police, firemen, and Caltrans worked 24/7 for two weeks to clean up the freeway and re-open it. The 2nd photo is the startling difference when opened again on January 22nd. The community is working to get back on its feet and go through a healing, but there's so much more to this. The Thomas fire that began in Santa Paula December 4th and raced south from there where it grew to a frightening blaze. It's now documented as the worse fire in California history. The blaze spanned for sixty miles and it felt as if it would never go out. A long drought, and not a drop of rain prior to the fire since last spring challenged 8,500 firefighters. Terrifying. Holiday festivities were cancelled in Santa Barbara and the other towns effected. There was a pervasive eeriness. The empty streets were left to the braver ghosts to wander. At one point, we thought the entire town would burn down. Between mandatory evacuations and most of us needing to escape the ash and smoke, when the only way to be outside was with a mask secured to our faces, left town or the state. It cleared the way for service workers to save our town. I've been a passionate and crazed activist for the environment and wildlife for more than thirty years. When I lived in LA and worked in Hollywood, I use to go to documentaries in the 80's made by a small, but special group of environmental filmmakers showing that, unless drastic measures were taken, global warming would wreak havoc. Here we are. Sooner than predicted. I have enormous respect for dedicated documentarians, activists, and organizations working for our good. Just in the last year, we've witnessed severe hurricanes, fires, blizzards, and floods giving us red flashing signs of climate change! Barely a breath, and the next disaster hit with a vengeance. Just two weeks past the fires and weary from the fear and stress, the first winter rain storm came. The hills were bare with fire holes from all the vegetation wiped out so evacuations were put into effect again. Residents got back into their homes just in time for Christmas. The holidays were surreal though. Everyone was thrown off balance. In the early morning hours on that fateful morning, I heard the rain outside my window from the safety of my bed. Just several miles away in Montecito, the water and mud rushed down the hills with a power surge taking everything in its path. 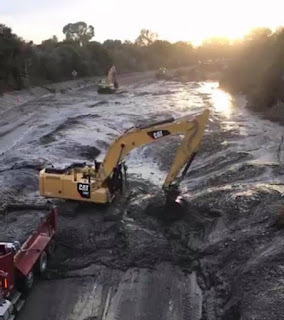 Within minutes, four feet of mud poured down in a rage destroying or severely damaging 500 homes. A house at the top was upended setting off a fire from a gas line. Some of the residents stepped out of their homes to investigate, and were brutally taken with the surge - some taken as far as the freeway and beach. The death toll in now twenty-one with two people still missing. There are/were others hospitalized from critical and more minor injuries. The mudslide took anything it could in its path, including animals, vehicles, large amounts of debris, and countless broken hearts. I ache for the loss and the despair for the families who've lost so much. My community has been shaken to its core, and will take an indeterminable time to recover. While I feel sadness, I also feel angry. We are the stewards of this fascinatingly and intricately divinely designed planet! I don't know why everyone isn't shouting from the mountains in protest. It will take much more than minimizing use of water/electricity, driving fuel efficient, recycling and getting off plastic. While we still have the right in this country to stand-up and speak out, and truth in media isn't shut down, dissent is the only answer. We are living in unprecedented times with the disgrace in the White House and seeing all that's valued in our country, the world, and our environment on a runaway train to no good. Many feel that praying, and meditating on love will heal all. While I think that's a wonderful practice (meditating myself on my own spiritual path), we're in for the fight of our lives. The scientists predicted a future of crisis on our planet with a plan of action in the 70's, but greed and selfish agendas continue to win over compassion and care for mother earth - the planet that nourishes us; provides the air we breathe and water we drink. I weep for our magnificent wildlife in extinction from pollution, lack of water, and disrupting eco-systems or poached by monsters. Life of all species are killed in these multiplying 'unnaturally' severe disasters we're now witnessing . January should be California's heaviest rain month. We've had one rain that created mass damage. Not a drop since. Thankfully, many of our spirits were lifted in hope by the women's rally and march. I saw an aerial video in a lovely shade of pink showing hundreds of thousands of women, men, and children all over the country marching in protest against Trump and his policies. I attended our rally in Santa Barbara. Many of the protest signs were in defense of our beloved planet. It was such a relief and a joy to see people gathering and connecting to stand up against injustice. Since I was a kid I, fought against what didn't feel right (including my older brother being bullied) and have always felt the need to be fiercely protective. In reflection, I think it comes from not being protected myself. I'm willing to stand in front of a car to protect an animal; I will do anything for a friend, especially if they're hurting, in trouble or in danger of harming themselves or others. I can't turn away when someone is suffering; I'd never sleep. There are millions of fellow-humans that feel the same way. I'm aware that my journey has put me on the outside. Dad couldn't have known how his determined expectation of me to be a strong survivor who can take anything thrown at her may have created more than an outsider. No one knows how fragile any of us are deep within. I'm no exception. Maybe he intuitively understood he'd die young from alcohol and his own demons, and could foresee that I'd have to fend for myself. It's tiring, and a very isolating path. I've felt covered in mud and debris countless times, and often unsure how to move forward. Am I crazy to care so damn much, and at this chapter in life, not give up and pass the torch? Am I crazy to be focused on justice when all my doctors advise me to focus on healing from 4-years of breast cancer and harsh symptoms of an immune challenge? Am I crazy to stay sober and off anti-depressants to get through the daily 'Trumpisms' as I observe everything I believe in rushing like a mudslide and crashing hard? Am I crazy to encourage others to get on board? Am I crazy to feel so worried for where this country and planet are headed when most of my life I've been in survival mode; or fighting for my own life? Am I crazy to not save myself and move to a deserted island (without Internet) surrounded by aqua blue water nourishing my mermaid spirit? I probably am a little crazy - a complex mix of believing in fairy tales and a sliver of hope to see my passion-filled dreams miraculously manifest, and fierce determination to fight injustice and protect what's sacred and beautiful. What a great tag line and lead in to what so many folks walking around in this country are so oblivious to and is so obvious. How many more natural disasters will it take for folks to believe what the climatologists and scientists have been sounding the alarm on for years now! Please keep writing on things that matter!